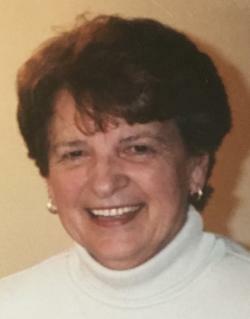 The death occurred peacefully at the Maplewood Manor, Alberton, on Wednesday, January 30, 2019, of Mary Beatrice (Bea) O’Brien, beloved wife of Jack O’Brien of Alberton. Born in Fortune Cove, PEI, on March 4, 1934, she was the daughter of the late Lemuel and Gertrude (Perry) Arsenault. Mother to six children, including Judy (Pat) of Calgary, AB, Michael (Veronica) of Regina, SK, Joe (Paula) of Edmonton, AB, Patrick (Korina) of Nanaimo, BC, Lloyd (Sheri) of Nanaimo, BC and Maureen of North Vancouver, BC, and grandmother to nine grandchildren. Jack and Bea raised their family in Montreal before moving to Winnipeg, Moncton, and finally back to their beloved Island upon retirement. Bea was an avid bridge player, attaining the rank of Life Master. She also volunteered her time with the Alberton Museum and local community organizations. Survived by siblings Irma Garrett (late Lou), Amherst, NS, Adrian Arsenault (Emily) of Alberton, PEI, Gerald (Carolyn) Arsenault, Alberton, PEI, and Trudy (John) Godden of Calgary, AB. She was predeceased by siblings Vincent (late Roseina) and Alban. Very special thanks to the staff at the Maplewood Manor and the Western Hospital for the outstanding care the past few years. Resting at the Rooney Funeral Home & Chapel. No public funeral or visitation by personal request. A private graveside service to be held at the Sacred Heart Cemetery, Alberton, at a date and time to be determined. As an expression of sympathy, memorials to the Western Hospital or Alzheimer Society of PEI would be gratefully appreciated. At a later date and time.